Call for Papers: Journal of Gender Studies, volume 22. We are pleased to inform you that the Call for Papers is open for our upcoming issue of Journal of Gender Studies (volume 22). It is scheduled to be published in July 2019. We are currently calling for original manuscripts in any field of gender research, written in Japanese or English. Contributions by Gender Studies researchers worldwide are welcome. 15 February 2019 (Fri.), 5 p.m. Japan time. All manuscripts should be unpublished original research, written in Japanese or English. 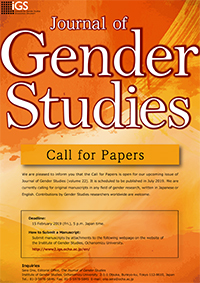 Submit manuscripts by attachments to the following webpage on the website of the Institute of Gender Studies, Ochanomizu University. Fill in the submission form and submit the manuscript by attachment. Please ensure that the main text and abstracts are provided in both MS Word and PDF files, the tables and figures in MS Word/MS Excel and PDF files, and photographs in JPEG and PDF files. All those files need to be submitted as attachments. * Please note that all English manuscripts should use Style Sheet for Journal of Gender Studies. Copyright © 2015 Institute for Gender Studies, Ochanomizu University, 2-1-1 Ohtsuka, Bunkyo-ku, Tokyo 112-8610, Japan, Phone: 81-3-5978-5846 Fax: 81-3-5978-5845, All rights reserved.